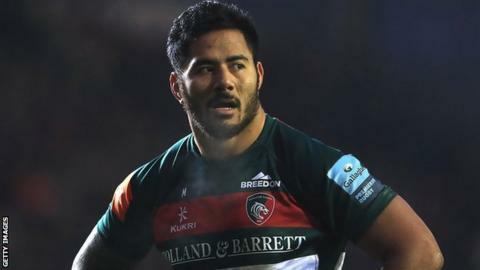 Manu Tuilagi says playing for England is a "feeling you can't replace" after he rejected a move to French side Racing 92 to stay at Leicester Tigers. Tuilagi signed a two-year contract at Welford Road this week despite a bumper offer from the Paris giants. A move overseas would have curtailed the 27-year-old's revitalised England career because of the Rugby Football Union's selection policy. "Playing for England is massive," Tuilagi told BBC Sport. "It's a feeling you can't replace. Hopefully I will keep playing for England." Tuilagi says he thought long and hard about a move to France, but it was "always his aim" to stay at his boyhood club Leicester and remain eligible to play for his country. "I couldn't be happier with the decision that I've made. I'm over the moon and I'm happy it's done and I can focus on Scotland at the weekend," he added. "There were times when I wasn't sure what to do but my aim was to stay. I had a lot of talking with my family about what we should, but it came down to us staying here a bit longer. We like it here." After years in the international wilderness because of injury, Tuilagi has returned to the England fold in the past six months, and is set to start every Six Nations match this year for the first time in his career. Tuilagi says he also felt loyalty to the Tigers, who he first represented a decade ago and who stood by him during his injury-ravaged spell. "Tigers is a massive part of my family, and it would have been very sad for me to leave," he said. "The club has helped me throughout my whole career and hopefully I can repay that."